Return to the world of The Island and discover what Walt's life was like before and after he met Leia. 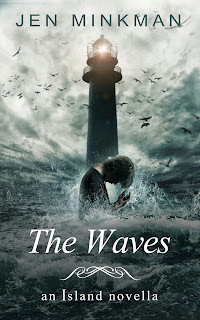 In Hope Harbor, either you have faith in the goddess Annabelle, or the Unbelievers over the wall will strike you down. For Walt, he just doesn't know what to believe any more. Hope Harbor is but one half of an island community on Tresco, separated by a wall and diving the island into two. Parents of the small, but deeply spiritual community have passed down the warning through the generations, that it isn't safe on the other side of the island, the unbelievers are bloodthirsty savages, ready to strike at any moment. But if the Unbelievers are supposed to be uncivil, how come they've never attacked? Fifteen year old Walt is beginning to question life in Hope Harbor, why his grandfather Thomas is insistent on praying to an unsubstantiated goddess and her daughters, that they will rescue the citizens from the island. But Walt finds the divine salvation had to swallow, especially when the extreme views of Thomas lead his mother to joining a religious order of the Golden Ship, believing that their Goddess was waiting for believers in the afterlife, becoming a mass suicide pact, his father and grandfather Thomas hiding behind the lie that his mother suffered from an illness that had taken her life. The revelation drives Walt straight to the forbidden wall. His only sympathiser is rogue cousin Yorrick, who as bookkeeper, confiding in Walt that he has seen the ancient texts depicting how life began on the island, clearly something is amiss. They've been told that there is nothing beyond the island, but Yorrick knows otherwise, and what he knows may just put his life in danger. Two years later, and some inhabitants of Hope Harbor have been building a sea vessel in secret, under the cover of darkness. Curiously, Walt ventures over the wall, where he stumbles upon a girl his age. Leia, with her dark silky hair and bright eyes is harboring a strange book she claims she had stolen from an elder of her community, a book their lives depend on. She's an Unbeliever, but hardly a savage and disproves the theory of the Hope Harbor community that they are a dangerous group. Now eighteen, Walt understands the lies he's been told his entire life are simply that, lies. But when he stumbles upon Tony, a shipwrecked man from the mainland, he finally learns how life on the island began. Tony is searching for his shipmate that seemingly has been lost at sea, until the two discover that he has been captured by the Unbelievers. Tony brings word from the world, and how a plague had swept through society and a group of healthy children were shipped to the island for safekeeping, but presumed to have long since bred out. The two communities of Believers and Unbelievers, once being one group of castaways, now separated by their belief and ignorance. To gather the two groups together, it will take a hostage situation, two determined teens and a promise of more to life than the only home they've ever known. The Island series is simply the most entertaining novella's by far, and now readers will have an insight into Walt's life leading up to meeting Leia, and beyond. On both sides of the island, the inhabitants have segregated long ago, with one group believing in a Goddess that will be their salvation, with the Unbelievers taking their cues from a children's Star Wars book. I absolutely love this mini series of novellas, it's uniquely brilliant. As with the first, The Island, I would love to see these turned into full length novels. Jen Minkman has created a strange segmented community in a post apocalyptic world that you simply can't put down.